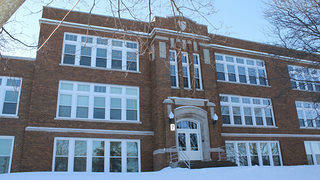 Built in 1922, the old Oconomowoc High School sat vacant for years before being converted into apartment units. Largely vacant since 2008, the old Oconomowoc High School had outlived its usefulness as an educational facility. Meanwhile, developers had identified the area—about 35 miles west of Milwaukee—as an ideal market for an affordable housing venture, but were having trouble settling on a site for new construction. Thanks to historic tax credits, the marriage was made. By 2014, the property—formerly a drain on City coffers—was generating tax revenue through 55 new units, many available at below market rates. Architects researched photographs from the 1930s and '40s to see what the school looked like in its early years. In the years since its closing, the school had been the site of an annual haunted house, so parts of the interior were painted completely black, and the 1922 building had undergone several major renovations during its life as a school. But Keystone and the architects at Excel Engineering wanted to return as much of its original look and feel as possible, digging up photographs from the 1930s and '40s. 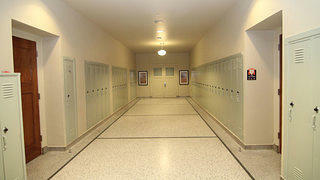 Now, hallways still look like you might find chatty teenagers and bookbags; the original terrazzo floors have been restored and the lockers were refurbished but left in place. Many of the apartments still have chalkboards and unique built-in wood cabinetry, though adding plumbing to each was a challenge. According to Mayor David Nold, who was on the City Council at the time of the renovation, maintaining that familiar feel was important to the community. 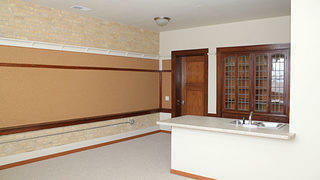 Original features like chalkboards and built-in cabinetry were incorporated into many of the units. Of course, the value to Oconomowoc hasn’t just been sentimental. As the high school was turned into apartments, the city sold an adjacent property and developed it into a privately owned assisted living facility, ultimately turning two fruitless plots into tax revenue. The total estimated cost of the school renovation was $10.9 million, with more than $1.7 million coming through historic tax credits. The city’s experience is yet another example of the economic development driven by the credits in Wisconsin, a state with its own robust preservation incentive. In 2013, Governor Scott Walker signed into law a raise in the credit’s value from 5% to 20%, and in the following six months, the state received applications proposing over $180 million in investment. Overall, the state leveraged $621 million in private investment from 2001 to 2014 through historic tax credits. As for the old Oconomowoc High School, Schultz doesn’t see how it could’ve happened without them.